For restoration by the Pemberton Tramway Co. This photograph is kindly provided by Neil Blinco and shows SSM2 at Pemberton shortly after arrival from Manjimup. The connecting rods and cowcatcher are sitting on a pallet as these were removed to facilitate SSM2's transfer from Manjimup. The West Australian Government Railways G-class / South Australian Railways Y-class 2-6-0 design was popular with WA timber concerns for use on their bush tramways, with many units obtained second hand from various Government railway systems. The South West Timber Hewer's Co-operative Society also settled on this type of locomotive as suitable for their needs, but rather than obtaining a second-hand example an order for a new locomotive was placed with Beyer Peacock & Co, Manchester in 1910, becoming builder's number 5475 of 1911. 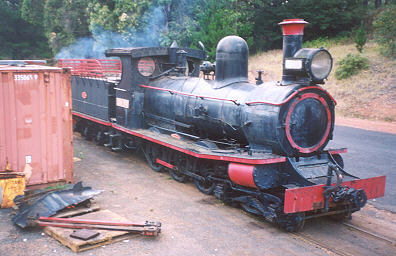 It was assembled at the WAGR Midland Workshops and named "The Hewer", first being deployed to the Lucknow Mill, Collie. It was later transferred to Holyoake, near Dwellingup. The State Saw Mills took over the operations of the South West Timber Hewer's Co-operative Society in 1920 and The Hewer became known by the less colourful identifier "State Saw Mills No.2". During its career it was transferred between mills at Holyoake, Deanmill and Pemberton, finally being withdrawn in 1967 from use at Deanmill. Fortunately SSM 2 was saved for preservation and placed on display under a weather roof at Manjimup Mill. In 2002 it was donated to the Pemberton Tramway Co. and transferred to Pemberton on 4 & 5 February 2004. SSM 2 / The Hewer is now displayed in at Pemberton while awaiting restoration. The Pemberton Tramway Co website includes a useful history for SSM 2 / The Hewer with some historical photographs and details of its movement to Pemberton their information page for SSM 2.
b Information provided by Neil Blinko via email dated 7 April 2004.